The human, fleshly appetite is insatiable. Two blades are replaced by three, and three are replaced by four, and four are replaced by five. More is better. At a local restaurant, I snapped the photo to the left. With four meals replacing three, I can’t hardly wait to see how the competitors respond. The world is full of enticements. Even marketers entice us to do contrary to what is right. Whether it’s an invitation to Vegas or to eat unhealthily, the messages are everpresent. 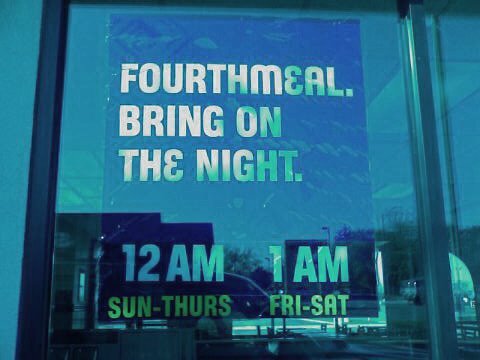 It’s not that there is anything innately sinful about supporting a taco restaurant, but there is a similarity between the marketing of a 4th meal in the middle of the night and the way sinners tempt us to sin against God. The appeal by both is to the flesh and not to real physical or spiritual needs. The last thing our body needs is an extra meal. But people are subject to these messages by giving in to the lust for more and more. The last thing we need is to have out of control appetites that lead to direct sin against God. And like marketers who want us to buy more of their stuff, sinners are hard at work But that is what sinners entice us to do by appealing to our flesh. Enjoying an extra meal is not a sin, but don’t make it a habit. Besides the physical harm it does, the out of control appetite can become god (Philippians 3:19, “whose god is their appetite“) which makes the devil very happy. So I take it you’re a strict three-mealist? The devil tempts us to eat or indulge to replace what we really need, as Christ needed to trust in God during His temptation (Mt. 4). I’m sure we are never going to acheive perfection in these areas, but we must listen to God and be led by the Spirit in every aspect of our lives. The alternative is sickness and death. When the Corinthian church came to together, it was for the worse and not the better (1 Cor. 11). They were supposed to assemble to remember the death of Christ, but they were instead satisfying their carnal appetites which meant their relationships in the church were neglected. Because of this, many were sick and dying spiritually. They were suffering God’s judgment so that they might come to their senses. We can’t escape the world. We are in it but we are not to be of the world. So we must be entrusting ourselves to God always being fully aware that the world is full of enticements designed to take us from Him.